It occurred to me as I started to put this post together that the very first time I prepared this dish was for the first Thanksgiving Mike and I ever spent together. I was still living in Boston at the time, and we had planned to spend the long holiday weekend together in New York as well as to prepare a traditional Thanksgiving dinner for ourselves and a couple of friends. 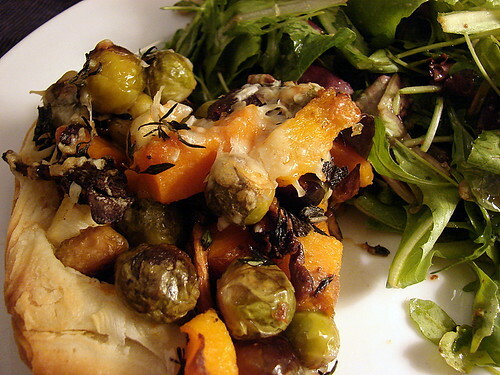 One of those friends was a vegetarian, so I wanted to prepare something that would serve as both a veggie side for us and a substantial main course for her, and thus my roasted vegetable and gruyere tart was born. 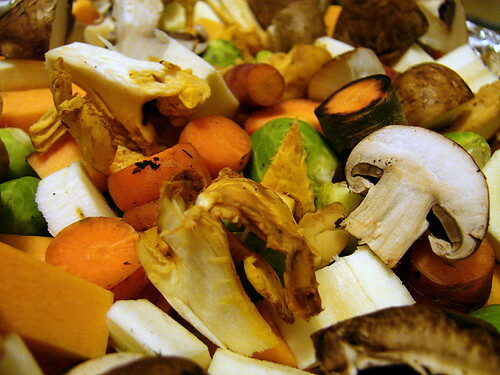 This is almost embarrassingly simple to put together – just cut up a variety of autumn vegetables (I used a mixture of tiny Brussels sprouts, parsnips, multicolored carrots, butternut squash, and crimini and chanterelle mushrooms) into roughly the same size, toss them with salt and a bit of olive oil, and roast them in a 375 degree oven until tender, about 40 minutes. Sprinkle a generous amount of fresh thyme and chopped fresh sage over the veggies and gently toss. Roll out your crust and place into a lightly oiled pie plate, leaving a bit of overlap around the edges (I generally use good quality prepared pie crust or, as I did last night, all butter puff pastry. Feel free to use homemade crust if that’s your thing). Spread about half a cup of grated gruyere cheese on the crust, add your veggies, sprinkle a bit more cheese on top and fold over the loose edges of the crust. Place back into the oven (at 400 degrees) for about 20 minutes, until the crust is golden, then slice into wedges and serve. As a side dish or main course, it’s simple enough for a weeknight dinner, but nice enough for company – a real double-duty gem.